This is a decadent and delicious lasagne, perfect for serving to guests. Adding the porcini soaking liquid to the béchamel is ingenious and adds so much flavor. I added a bit of sautéed minced garlic to the mushroom mixture, and some wilted spinach with the ricotta layers. Like many lasagnes, it was even better reheated the next day. This is quite delicious but almost three hours from prep to table. We thought it to be the sort of entree that could be served at a party to meat eaters without any complaints. Other reviews state that doing the prep the day before is helpful to reduce the time. I didn't make the fourth layer of noodles rather spread the sauces and mushrooms more liberally between three layers. This is worthy of making again. Delicious! I paired this with Ottolenghi's tomato and pomegranate salad from Plenty More and that cut nicely through the richness. Not quick but I prepped this the day before my dinner party and just had to make the salad on the day. Amazing but very rich and definitely not a quick meal. Also rather expensive with all that cheese and mushrooms. A special occasion dish. Love this recipe. 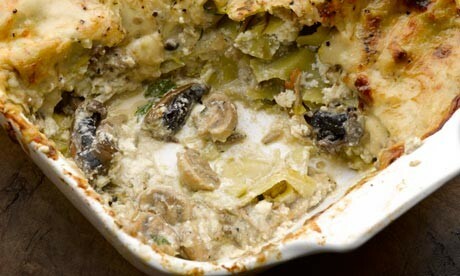 If you love mushrooms this will be a favorite in your house!Definitely a special occasion meal, very high in fat.